If you keep up to date with all our previews lately, you might have noticed that Netflix has already begun putting out new original festive content to coincide with the upcoming Christmas holidays. Most of them seem to be the type of cheesy romantic movies you would normally find on the Lifetime channel, like The Princess Switch with Vanessa Hudgens (which I will NOT be reviewing because I honestly don’t have the time), but regardless they seem to be ahead of the curve by getting their festive flicks out of the way with plenty of time before the big day itself. However, they’ve just released what has to be their biggest Christmas movie yet, The Christmas Chronicles, and since I happened to have a bit of spare time I decided to check it out, especially when it’s advertising pretty heavily that it features Kurt Russell in the role of Santa Claus, and you’d have to be a serious Grinch not to be at the very least interested in that. 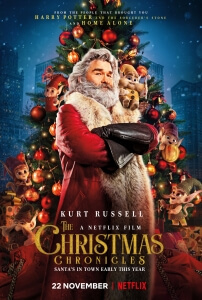 The good news is, Russell is awesome in the part, and the movie itself is a harmless, perfectly serviceable bit of family entertainment, although outside of Snake Plissken as Saint Nick, there’s not much else to it that truly stands out. The film introduces us to Teddy (Judah Lewis) and Kate Pierce (Darby Camp), two siblings who are about to have a more sombre Christmas this year because it’s the first since their firefighter father died whilst on duty. Kate, who is significantly more into the Christmas spirit than Teddy is, convinces him to help her in a scheme to catch Santa Claus on videotape during Christmas Eve, which ends up going a little too well as they soon come face-to-face with Santa himself, in all his Kurt Russell-shaped glory, albeit at the expense of damaging his sleigh and separating him from his reindeer and sack of presents. Trapped in Chicago, it’s now up to them to help Santa get back on track if he is to make the final Christmas rounds before morning comes, and before the world loses its Christmas spirit if he doesn’t make it. If you’ve seen any other Christmas special ever, then you know how this is all going to play out. This kind of plot is about as old as Christmas itself – the one where Santa’s annual rounds is rudely interrupted, and it’s up to individuals to save Christmas – and the movie doesn’t do much to deviate from expectations, so adults will probably watch this film thinking that they could be watching other movies like this, such as Ernest Saves Christmas which I know for many is a Yuletide classic of a different variety. Children will be wildly entertained, though, but that was kind of a given seeing how this is a film clearly marketed for family audience, with a heavy lenience towards younger audiences, especially in some of the slapstick and cartoonish CGI (which I’ll get to momentarily). However, I feel that this movie would have had a little bit more of an impact, and probably would have been more memorable, if this was a raunchy adult comedy; they seriously should have gone all out and made this a filthy, foul-mouthed and possibly even politically incorrect R-rated flick in the guise of a cheesy family Christmas special (in fact, there were times when I was imagining a curse word being slipped in there every now and then whilst I was watching it), which regardless of whether or not that would have been any good would have at least made this movie stick out a little bit more. But nope, this is pretty much exactly the kind of film you’d expect to see; harmless to a fault, wholesome without ever being too threatening, and enough cheese to fill an entire board at a friend’s Christmas do. I mentioned earlier all the other festive movies that Netflix has been releasing over the past few weeks, and how they all look and feel like a cheap-ish Lifetime Original Movie, and although this perhaps has a little more ambition than something like The Princess Switch (though again, I won’t know because I won’t be reviewing it for this site), this is still shot like one of those movies, certainly acted like one of those movies (the two kids, especially young Darby Camp, are so precocious you wonder if they came from the same child-star factory they made Miley Cyrus or the Jonas Brothers in), and features some pretty bad CGI that feels like it was all rendered in no time flat. The effects in this movie, from the green-screen to these horrific-looking elves that look and act like the Smurfs by way of the Minions, are more cartoonish than if this movie were an actual cartoon, and it can often be distracting how bad the CGI is here. Again, kids won’t be savvy enough to pick up on that, but as an adult I thought they were pretty terrifying to look at (one of them threatens a main character with a chainsaw at one point, which is supposed to be a gag but they’re scary enough as it is, guys). However, most if not all of that can be overlooked or forgiven entirely, all because of one very important fact: Kurt Russell is playing Santa Claus, and he is amazing at it. He is clearly having the time of his life here, adopting a no-nonsense attitude that’s very Kurt Russell – and again, it makes me wish this movie was more adult-oriented, because to hear this Santa curse up a storm is all I want for Christmas this year – but he has such a huge heart to him that it’s hard not to be charmed by this guy. There’s a scene where he ends up in jail – because there’s a scene in every one of these movies where Santa Claus is thrown in the slammer – that exhibits all of this, in a rousing (if out of nowhere) musical number that’s just as eye-opening and fun as Russell himself is here. It’s a bit of a shame, then, that the movie he’s playing Santa Claus in isn’t quite as memorable. It’ll entertain kids just fine, but adults will probably have to keep wishing for an extra-special present this Christmas. The Christmas Chronicles doesn’t do much to stand out from every other Christmas family film out there, except for Kurt Russell who’s having a fantastic time playing Santa Claus in his own unique way.